When the dish I am cooking calls for broth, I have always (always!) used bullion cubes or powder. Doing so, though, is something of a pain. It was always hard for me to get the bullion or powder to thoroughly dissolve in the water. That got a lot easier when I got my immersion blender, but it was still extra work, and I’m still getting the blender stick and a cup dirty. Watching Rachael Ray I’ve noticed that she normally uses pre-made broth in a carton. I’ve tried it recently, and I find it much simpler and easier. I haven’t compared the cost, but I assume the carton version is more expensive. I’ve found, though, that what comes in the carton is strong enough that I can safely use half broth and half water. The dish has always come out fine that way. It may cost a little more, but it simplifies meal preparation where I normally have plenty of other work to do. And anyway, Rachael Ray says it’s OK, so it must be, right? I wrote a while back about how I was quite annoyed that Google was discontinuing two tools I’ve used regularly, Google Reader for news feeds and Postini for spam filtering. The iPad/iPhone app I’d been using for my news feeds relied on Google Reader, as did most. I was not confident in the creator’s ability to come up with something new before the end of Reader on 1 July (though he seems to be making progress), so I looked around for alternatives. I landed on Newsblur, which is pretty nice. It doesn’t play nicely with Internet Explorer 10, but it works fine with Firefox. Besides, my primary devices for this function are my iPhone and iPad, and the iOS app is really nice. I actually like it better than my old one. I do have a couple of quibbles. I never got an answer to my support question about IE10, but it’s a small, one-person show, as many of these things are. And when I try to add a feed from the iPad app, it doesn’t show all the folders, so depending on the folder to which I want to add the new feed, I may have to add it from my PC. But those are small things. At $24 a year for the Premium version I’m quite happy with what I’m getting. My email and Web hosting company had been using Positni for spam filtering for a number of years, since well before it was bought by Google. For the most part it worked very well, and I had been quite satisfied with it. With Postini going away, they switched to a service from McAfee. At first I really felt that it was a step backwards. There is less user control than with Postini, and it captured a lot of stuff that was not spam. For example, any email with “unsubscribe” in it is spam. (Are you kidding me?) And I could find no way to modify or remove rules. So I just had to keep adding companies and organizations to my allowed list. In addition, the first few days it let through a lot of stuff that was spam. For my Yahoo! groups, it captured half or more of the postings as spam. Adding the group email address (GroupName@yahoogroups.com) to the allowed list doesn’t help. I guess it’s looking at the actual poster’s email. Postini had a separate place to enter email groups you belonged to. So, I turned off email and now visit my Yahoo! groups on the Web. Which is annoying because I like the “push” functionality of getting individual emails. Still, after using the McAfee tool for a few weeks, it’s learned most of the senders whose emails I want to get, and the amount of spam that slips through is smaller than at first, so I guess there was some fine tuning going on in the background. Most of that is caught by Outlook and Norton Anti-Spam in any case. I also have noticed that with McAfee a lot of stuff that is clearly, blatantly spam never shows up at all, and with Postini I had to wade through it all. And I have to admit that Postini did catch things that were not spam and did let some spam through. No system is going to be perfect. Ultimately, I think both replacements are improvements. Besides, as some of my Facebook friends have been known to say, I totally get that these are first world problems. So onward to matters of more pressing importance. We’ve been going to the Gilroy Farmers’ Market for the past couple of years. For the past two years it was on Sunday, so it worked out nicely to come home from church, get changed, and head over there. I enjoyed getting a Silva sausage for lunch, which, even if high in cholesterol and not terribly healthy, was awfully tasty. This year the Farmers’ Market has had something of a makeover. It’s under new management, in a new location, and is now on Saturday. That works out well because we can drop by there as we head out on our Saturday shopping errands. The energy level seems higher, and there’s perhaps a slight change in the mix of vendors. No Silva this year, but then we’ve just had breakfast when we get there anyway. This past Saturday we got some marvelous fresh strawberries, sweet peaches, an unusual variety of red spinach (yes, red), and some tasty Italian Caponata hummus. It’s a nice addition to our Saturday routine. In the Episcopal and Lutheran traditions, the time between Epiphany and Ash Wednesday is called the season after Epiphany. The time from Pentecost until Advent is called the season after Pentecost. The Catholics do it differently. Both of those seasons are called Ordinary Time. I like that. I like it because it distinguishes between those times and the sacred, numinous, if you will, seasons of Advent, Christmas, Lent, and Easter. From one perspective, all time is sacred. From another there is something special, set apart (which is the root of the word “sacred”) about those four seasons of the liturgical calendar. It’s a perspective that works well for me. The Westminster Choir performs Lutkin’s “The Lord Bless You and Keep You” Benediction in Princeton, NJ. I got my new iPod earphones from Amazon. They came in one of those annoying plastic blister packs. They had three sets of ear pieces: one on the earphones and two included separately. 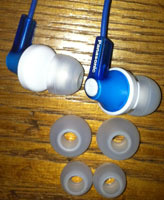 As I pried open the blister pack the alternate earpieces popped out. The two large ones were present and accounted for. I could only find one small one. I looked all around on the floor next to the computer table in my office loft where I had opened the package. Multiple times. Nothing. It could have been an error in the packaging, I thought, but that happens rarely. Later in the evening, when I went back in there to shut down the computer before going to bed, there it was on the floor, as plain as day, even though it was almost 10:30 p.m. I can’t tell you how often that has happened to me when it comes to household objects. I know better (I think), but I would swear that household objects sometimes slip into an alternate dimension for short periods of time just to annoy us.